A month or so ago we were discussing Darwin’s favourite programs when we said he’d never really got into a film. 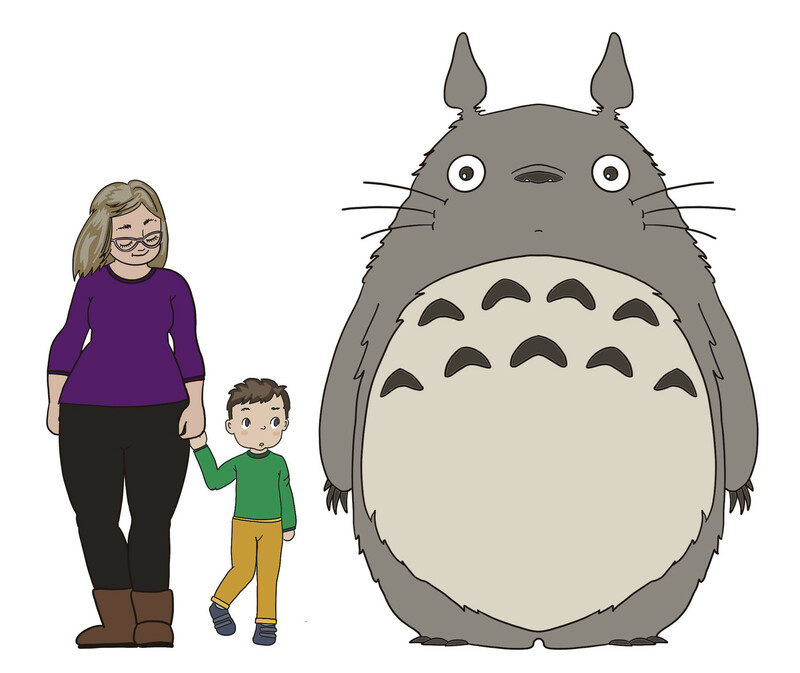 I thought, perhaps, that he might like Studio Ghibli’s My Neighbour Totoro. Russell wondered if he’d find it at all interesting, but as Darwin is obsessed with cleaning and the first half is essentially just people cleaning a house, I decided, yes, it would be worth a try. And that, my friends, is that day that life changed. See… Darwin didn’t just enjoy it. He fell for the film’s charms in an all-consuming way. Now life is Totoro. Totoro is life. He hums the theme tunes whilst he plays. He draws Totoro. Thanks to Nana he has A huge Totoro cuddly toy (and a medium one, and a little one) and a Catbus. 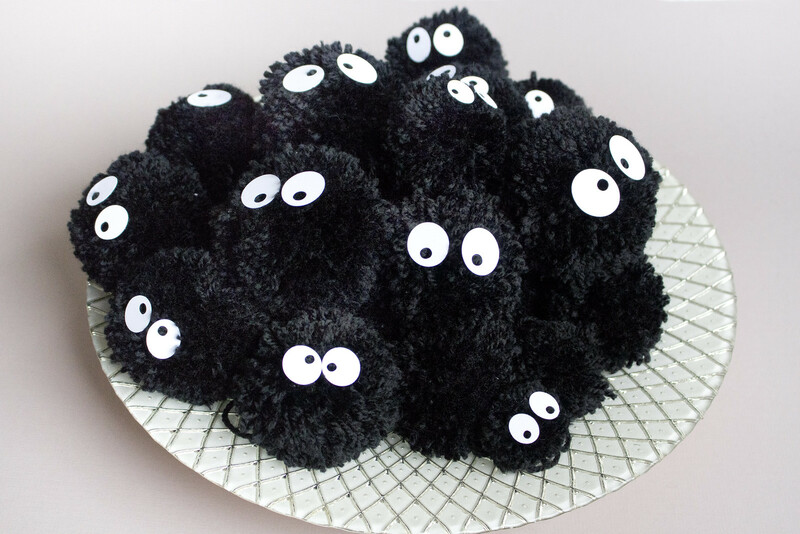 And so it was, when sitting with Nana, and worrying that she seemed to be searching the internet for Soot Sprite toys, I said that I’d had the idea to make some and stick them scurrying into the corner of the room, as they do in the film. I have a lot of these kind of ideas, at least ten a day, and none ever materialise because nobody has that much time or energy. 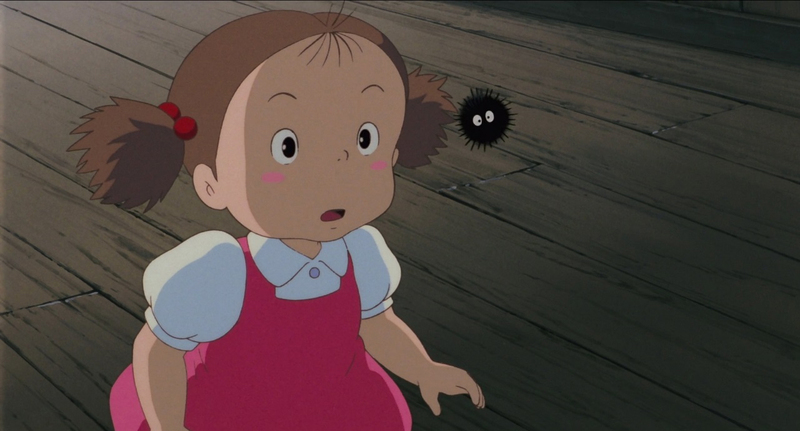 But Nana took that idea as something we must do, and before I knew it, we were making soot sprites. 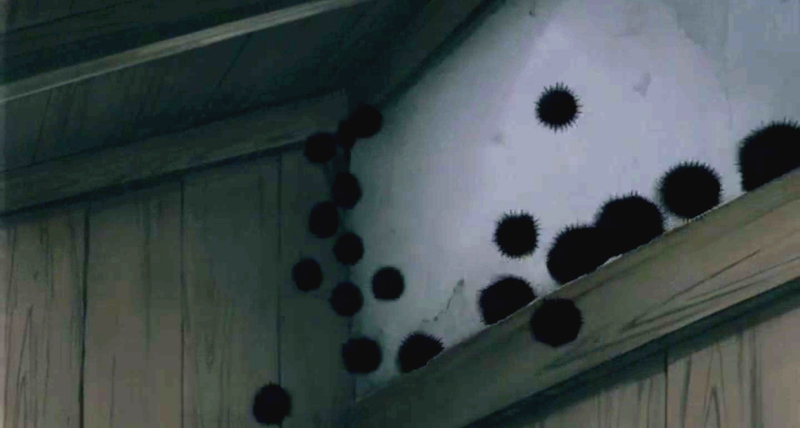 Though you cannot see from that picture, each little soot sprite has a face, consisting only of a pair of wide oval eyes. You can see them a little better in this image of Mei catching an unwitting soot sprite, in a scene my toddler likes to act out as it plays. So, we had a few chats about how to best make the little house guests. Little fluffy balls with faces. I looked at buying pompons, but it would have worked out for too costly, so we bought a 400g ball of black yarn and sat and made forty pompons. Or, rather, Nana made about 37 and I made three, because I have the attention span of a gnat and nana was amusingly enthralled by the Pompon makers I had in my craft tools (so much so that I have now bought her a set of her own). 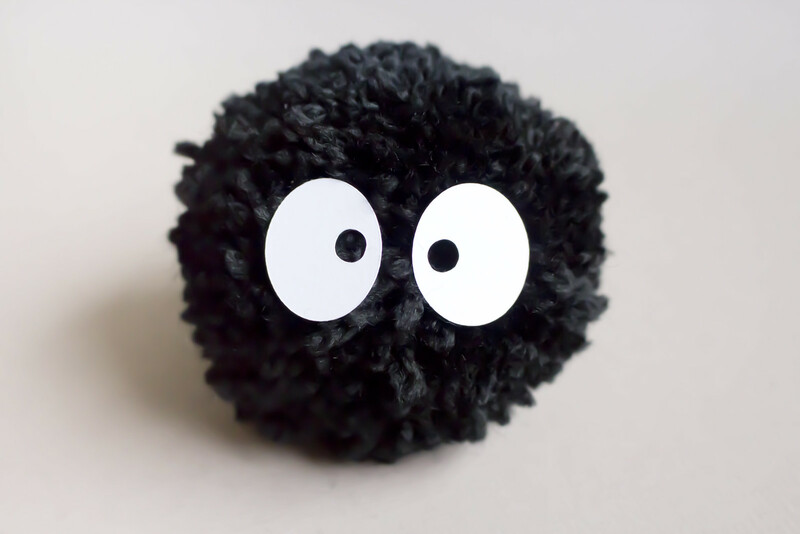 Nana curbed my desire to trim each of those pompoms into a perfectly rounded shape by reminding me that the soot sprites had little sticky-out bits – they were not perfect little round sprites – they were a little messy. Hnngghhh. 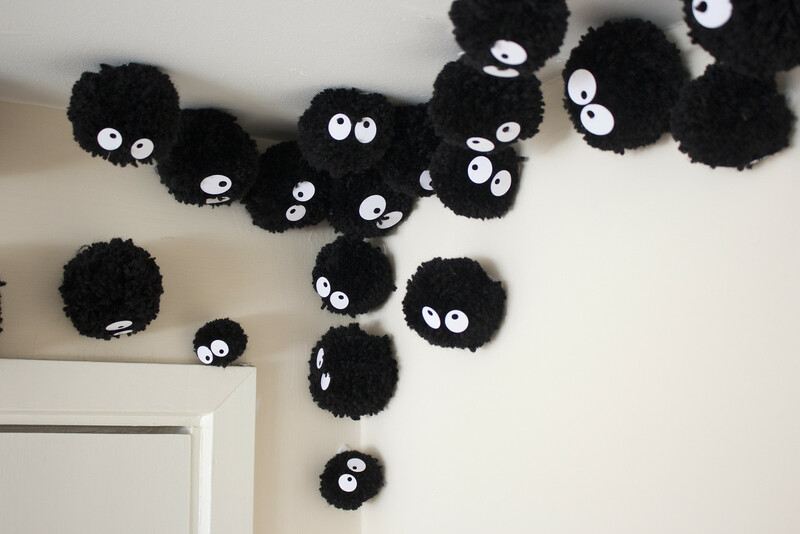 Each soot sprite was given a pair of eyes, simply made from ellipses of white card with a small round hole punched into it for the pupil. To provide a bit of variety, some were made with the pupils facing up, down, left, right and some straight ahead. 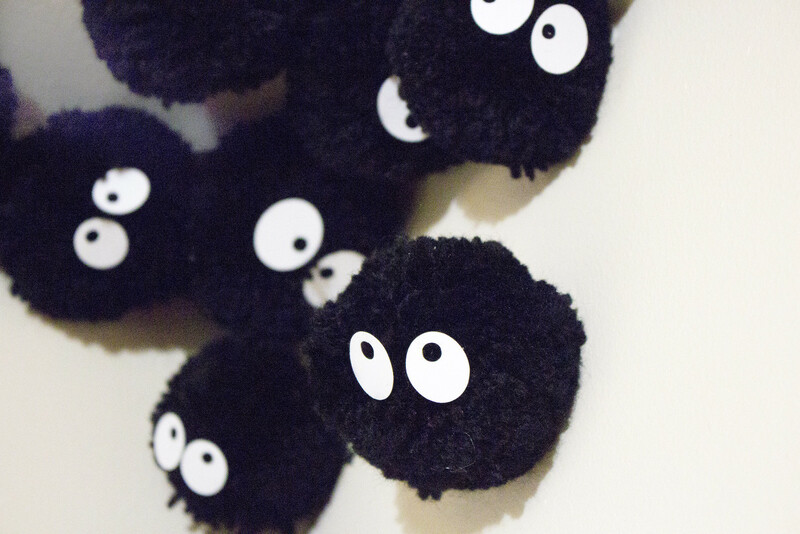 We also made several sizes of soot sprite, because in My Neighbour Totoro they are not uniformly sized. The one that Mei catches is very small, so we made sure to have a few smaller ones in the group. 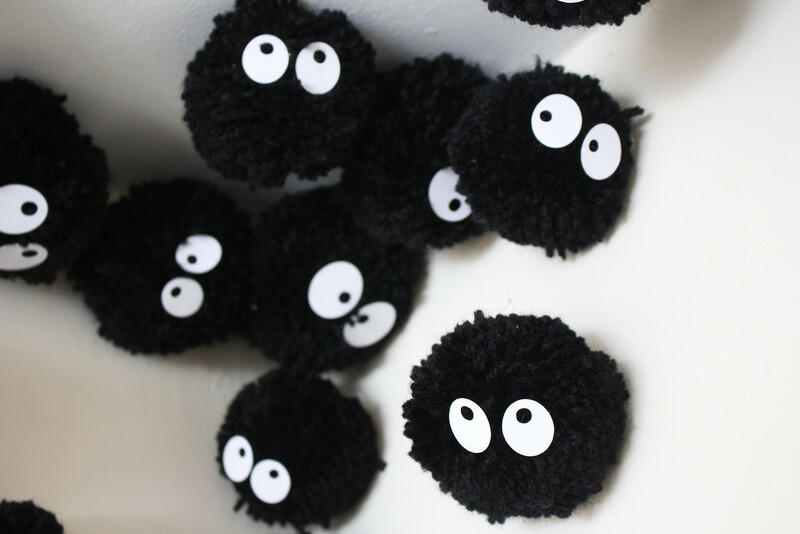 The eyes of each soot sprite were sorted into pairs and then attached using a generous amount of UHU glue, held into place against the bulk of the pompom yarn for a few seconds each. Once dry I arranged them as if they were scurrying into the corner of the room where the walls meet the ceiling. I attached them using a pack of Command Decorating Clips (the ones that are made for attaching fairy lights to walls and ceilings) and each clip is more than strong enough to hold up even the largest pompom. Attaching the soot sprites to the clips was a little fiddly, but achievable by using one of the long tails of yarn that are used to tie and secure the pompoms to wrap around the ‘hook’ of the clip, then tie in a secure double knot with the other yarn tail. Carefully peel off the backing of the command clip pad and press to the clip, then peel off the other side to attach to the wall. Be careful not to get the fluff and yarn of the pompom onto the pad or they may not stick as well. I love these little command clips as they are strong but cause no damage to the walls or paintwork and remove easily when no longer wanted (not that this will be any time soon). I love this unique little corner of our home, now. It was completely unremarkable before, but now it’s a little celebration of one of the little fascinations of a toddler. We made the pompoms whilst he was at nursery, but kept them hidden to finish them with eyes and hung them up whilst he was in bed so they were there when he woke up. It was a joyous moment when he spotted them! There are too too cool! !